The design is quite visible underneath the batiste without the use of a light box. Two equal size pieces of the batiste are cut to accommodate the size of the design allowing a generous border for easy hooping. For the bottom piece, I used a different batiste. It's still just as closely woven, but not quite as fine. 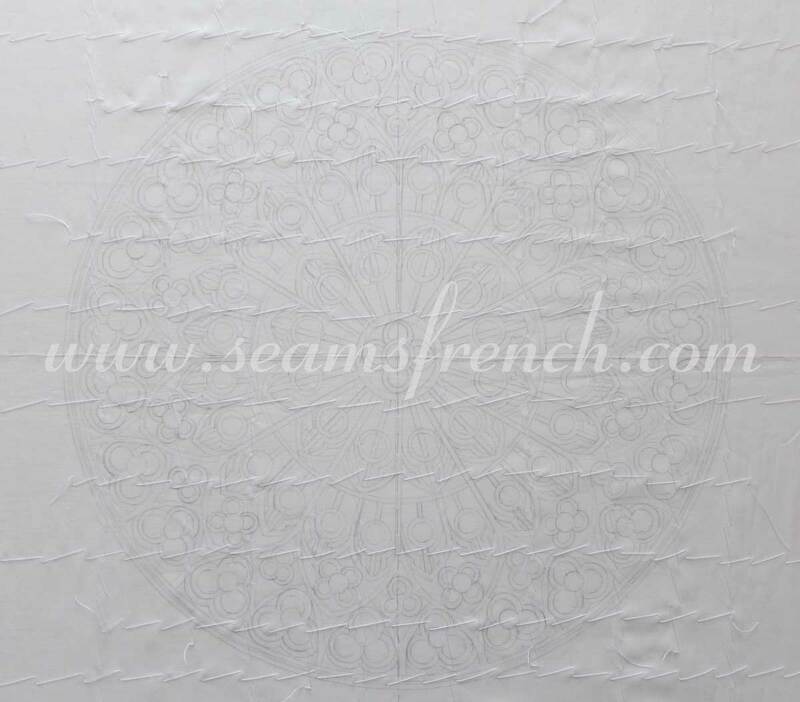 Strength is important because a lot of stress is put on the backing fabric during the cording process. For this type of work, the batiste is never pre-washed. This would cause the fabric and the yarn to shrink unevenly when washing the finished piece in the final step. 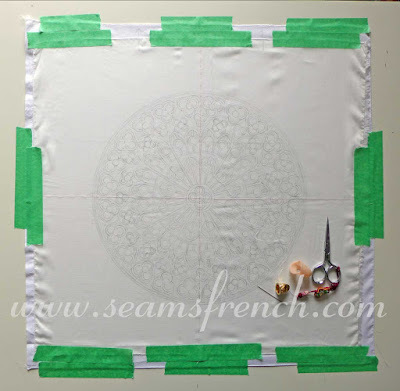 Before securing the fabric to the tracing surface, it is folded into quarters to mark the center cross hairs. 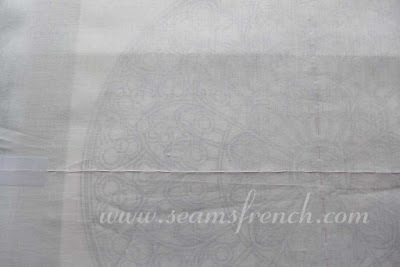 I add a quick basting stitch over these finger pressed lines for better visibility. Next, the batiste is centered over the motif and taped into place, keeping the fabric taut and square. The basted cross hairs are a helpful reference in keeping the piece square at all times. Because I didn't need the light box to trace this pattern, I taped everything to my cutting mat, which allowed me to turn the project to make tracing easier. The pattern has a sheet of white paper underneath it to make it more visible. Below are my drawing tools. 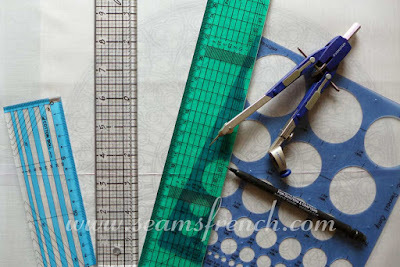 Depending on the size of the channels, (traditionally 4mm, but I prefer 1/8"), I use either a metric or an imperial ruler to draw the double lines. 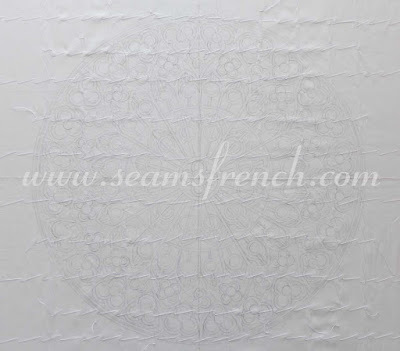 Compass and circle template are invaluable because of the many circles in this piece. After a lot of trial and error using various different marking pens, I have come back to the basic fabric marking mechanical lead pencil. It may be a little harder to wash out at the end of the project, but it gives me the most accurate line and when it's been washed out, it's gone. 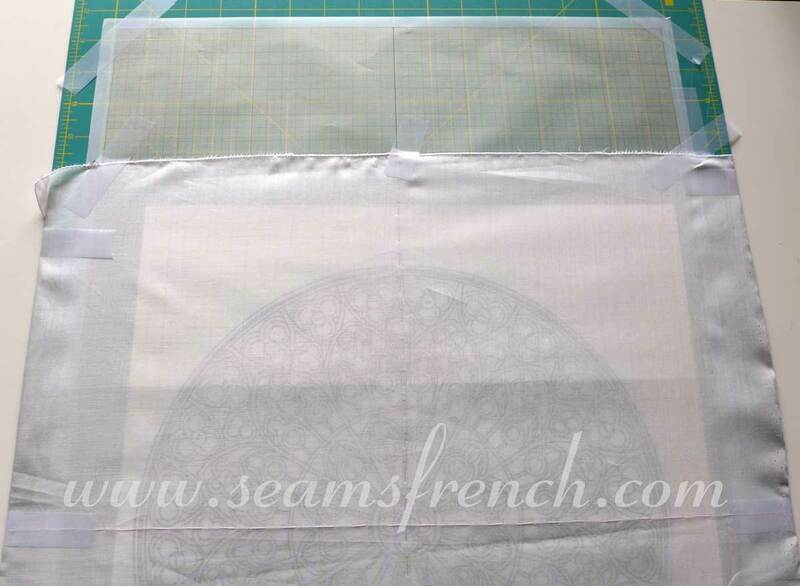 Once the tracing is completed, it's ready to be sandwiched. The two pieces are taped to a flat surface, wrong sides together, keeping the traced design on top. At this stage, it's very important that both pieces are square and have the straight of grain running in the same direction. The basted cross hairs help to achieve this. I also mark the straight of grain on each piece. Although not required, I prefer to cut the bottom piece slightly larger then the top. Just an old habit from sandwiching quilts! It's then basted in the same way we would baste a quilt, from the center out, alternating between the lengthwise and crosswise grain. Normally I baste every 2 inches, but I basted this one about 1" - 1 1/2" apart to reduce the risk of shifting the fabrics. Stitch ready! I'm looking forward to a lovely day of stitching and Netflix tomorrow. Oh yeah, and maybe the "Academy Awards". You look all set for the Oscars. Should be a fun day! Well, here it is almost noon on the west coast, and I am no where near my needle and thimble yet. Sigh! I will get there. It's going to be beautiful! What will you be watching on Netflix? The only Oscar (besides my cat) that I'm interested in is costumes! A lot of what I like to watch on TV is for the costumes, like Downton Abbey for example. I like watching period pieces for this reason; generally great costumes and wonderful scenery thoughtfully filmed, like "Bright Star", about the poet John Keats and Fanny Browne, the love of his life. Loved that movie, don't know that it's on Netflix though. Maybe I'll find something similar though.